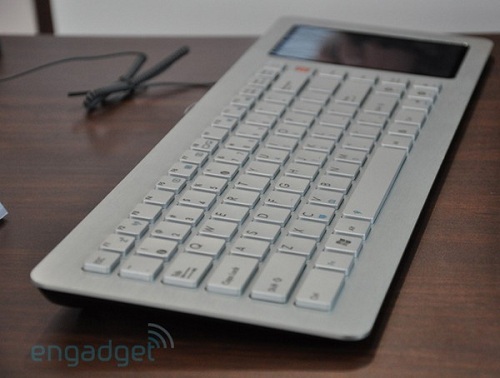 Rumor – Eee Keyboard To Be Released Next Month | OhGizmo! By Chris Scott Barr on 05/15/09 • Leave a comment! Back in March we showed you a different kind of Eee PC from Asus. The Eee Keyboard is basically your entire computer wrapped up into a nice neat keyboard package. It seems to be destined for the living room, what with it’s wireless HDMI and all. The 5-inch touchscreen is really what sells the device for me. Speaking of selling, when exactly can we expect to see these on the market? If rumors are to be believed, we should be seeing it by the end of next month. We don’t yet know any pricing details, but that should be revealed at the upcoming Computex show. With Computex, Apple’s WWDC and E3 all next month, we can no doubt expect a lot of announcements and releases in the next month and a half.